Pokémon GO has yet not been officially launched in India, but the location-based augmented reality game has already fueled a privacy debate and request for Ban. A Gujarat resident, Alay Anil Dave has recently filed a Public Interest Litigation (PIL) in the Gujarat High Court against Niantic, developers of Pokémon Go, over allegations that the game is hurting religious sentiments of Hindus and Jains by showing virtual eggs in places of worship of different religious groups. The launch date of Pokémon GO for India has not been announced so far, but millions of Indians have already downloaded the game from 3rd-party app markets and playing it on the streets. However, there are many still waiting for an official release of the game in India, as they don’t want to end up installing malicious versions of Pokémon GO that could install malware on their phones, allowing hackers to compromise their devices. Pokémon GO has become the most successful game launch of all time with more than 500 Million downloads in just over two months and has been making rounds since its inception just over two months ago. This game is reported to have almost as many daily active users on Twitter. In fact, Niantic Labs CEO John Hanke just announced that the Pokémon Go game app is coming to the Apple Watch on stage at Apple's iPhone 7 event on Wednesday. How Does Pokémon GO Hurt Religious Sentiments? But Why does Petitioner want India to Ban Pokémon GO? Actually, this augmented reality game requires gamers to walk around homes, parks and local surroundings to find new Pokémon characters, as well as achieve goals like hatching incubating eggs. One can find the most common Pokémon in the distance of 2km eggs, with the rarest ones in the 10km eggs. But, Niantic didn't know that some Indians have a problem with these eggs. "People playing the game get their points in the form of eggs which generally appear in the places of worship of different religious groups. To find eggs in temples of Hindus and Jains is blasphemous, and therefore my client has sought ban on the game from the country," Dave's lawyer said. However, we talked to some security experts and privacy advocates in India, who shared their opinions on the case. "Such PIL are frivolous and just designed to get the person his few moments of fame. Chasing a virtual image into a temple or any other place cannot be termed desecration of the place of worship and, like many other PIL this is also going to be a waste of the valuable time of the Hon'ble Court." "Some Hindu temples still have a tradition of Bali of Animals [Animal sacrifice]. So painting all Hindu temples as a symbol of non-violence and hurting religious sentiments isn't true." The Editor of Cyber Secure India Portal said,"There seems no strength in the PIL, frankly speaking. However, the PIL may just be appropriate, if the person who has filed the PIL, should have obtained a legitimate licensed copy of the game; otherwise, the charge may be dropped. Further, the fact that egg was found is a question of perception, being an animated pictorial representation." Along with hurting religious sentiments by displaying eggs in houses of worship, the PIL also cites that Pokémon Go could be used by the CIA to create maps of sensitive "areas currently unavailable in Google Maps." The PIL also raised some concerns over the game, like an infringement of the right to privacy, a threat to the life of players who walk around the street to catch Pokémons, game’s influence on the minds of children and "behavior as an Indian," among others. “All the maps are via open maps, already in the public domain so that issue is sorted. Use of AR in sensitive areas from government viewpoint can be a problem. To avoid this, use of camera phones and recorders should be banned in such sensitive declared as it is not just one game that can cause issues.” an anonymous follower comments. The PIL was heard on Wednesday by a division bench of Chief Justice R. Subhash Reddy and Justice Vipul Pancholi, and notice by the Gujarat High Court has been issued to Niantic Inc. of the US, which has yet to respond. 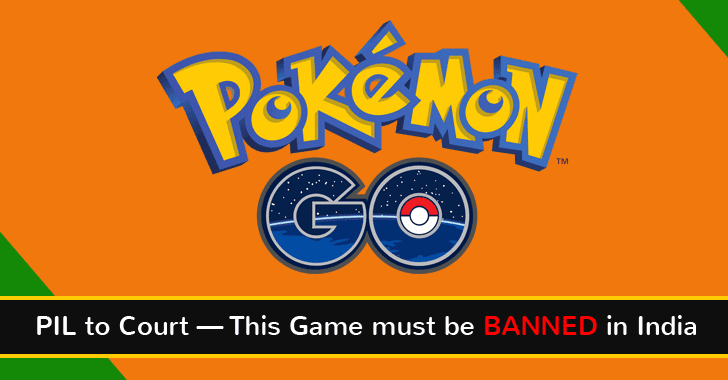 If Pokémon GO gets banned in India, it will not be the first country to do so. Last month, Iran officially banned Pokémon GO within the country due to certain "security concerns."